The WSJ published an article January 5th on the new emerging investor class in Korea. What really caught my eye (and my trusty buIIshlt detector) was the photo on the newsprint page. Click the link to the left to enlarge and see the official AP Photo caption. 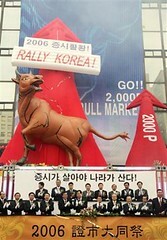 This includes mutual funds, which, according to the article, only became available in Korea in 1999. By comparison, in the US market, 49% of American households own stock, up from 39% in 1989 (source). Most of the increase in the US was due to a shift from defined benefit plans (pensions) to defined contribution plans (401k, IRA). This shift served as rocket propellant for the mutual fund industry and spawned massive marketing efforts to draw in more and more private investors. John Bogle (Founder of Vanguard Group) wrote an excellent, fact filled book on the impact this shift had on how companies are managed. The shocking thing about this photo is the naked embedded marketing message. Buy now or you will be left behind. This is just one picture, but if this is the tone the exchange wants to set, it looks like the birth of an irrational exuberance investor culture. The folks that run the exchange should realize they are running a market, not a casino. I still love the print medium for the WSJ because of the superior interaction with the news I feel when I am holding the paper…. it focuses my attention effectively. I might have missed this entirely if it hadn’t been for a long flight, and the real paper in my hands. Korea is itself in the midst of a seismic shift away from a form of “defined benefit” retirement plan — statutory severance pay under the Labor Standards Act in the amount of one month per year of service, which is in most cases simply carried as a contingent liability on the books of the employer (i.e., employer goes bankrupt, employee loses retirement benefit) — to a defined contribution pension system. The employer’s obligation will still be that same approximately 8.33% of wages, but in this case it would be paid into a portable 401K-style account which then could come under professional management. Rules on accessing this money pre-retirement are still sketchy, despite the fact the “private pension system” was approved in September 2005, but given the slow takeup of the reform (employees have to collectively approve a shift, and most of ’em are mistrustful) there are probably three or four years to go before this really gathers momentum. But oh yes — this coming wave of private retirement money, on top of the swelling balance of National Pension Plan (Korea’s Social Security) money now under private asset management, is going to swell the Korea Stock Exchange’s capitalization. A lot of money is going to be chasing these assets.